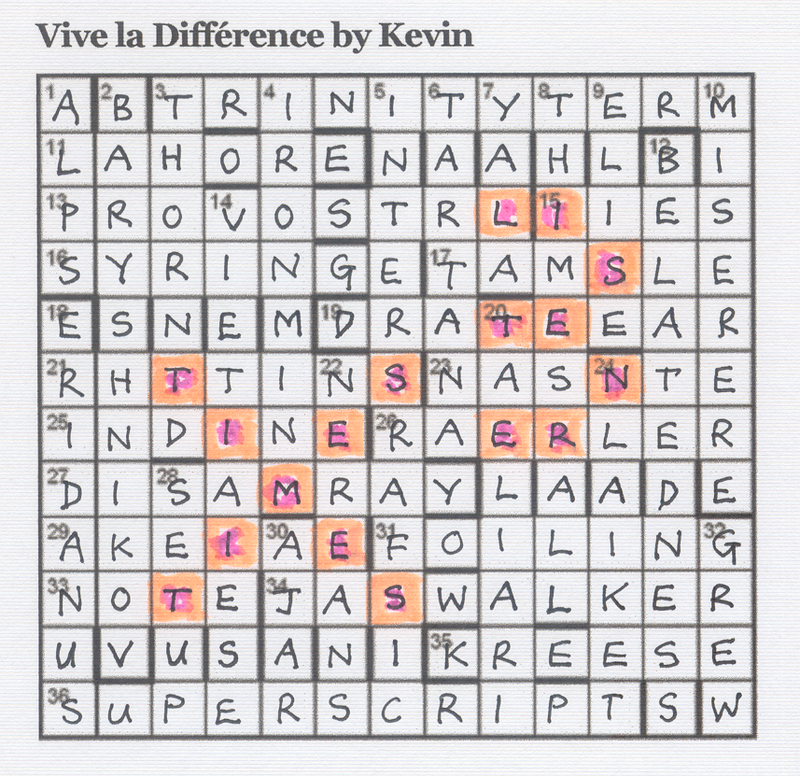 According to my records, this is Kevin’s first crossword, but a sneaky part of me thinks it may be one of the regular setters using a different pseudonym as a one-off. Anyway, hands up all of you out there who, like me, saw absolutely no importance in the 23 March 1991 date?! Shame on those of us who’ve been doing the Listener (even if only sporadically) for twenty years or more. And please don’t tell me it’s just me that failed to spot it!! Not that sussing out its relevance would have helped with the crossword to any significant degree. So, seventeen clashes to be found and replaced by the letter midway between them. I think I’ve mentioned before that a quick pass through all the clues is my preferred method of getting going. It has its drawbacks, as in this case, when it revealed a totally pathetic count of solved clues: three across and two down, with a clash where the Y of PROVOSTRY crosses the M of YAMA, enabling L to be entered. I did wonder whether the alphabet may be treated cyclically with the difference being M – Y = N, rather than Y – M = L, but nothing was given in the preamble to make me dwell on that. Luckily neither of the two letters in 1ac were clashes, and provide enough of a hint for me to get TRINITY TERM after only a short while fiddling with letters. I always try to spend a couple of minutes on an anagram by just doodling on my worksheet; I know that those of us with Tea, or who use Chambers Word Wizard, can cut anagram solving time significantly, but the satisfaction of getting them unaided is a real bonus. In the end, I didn’t need to doodle at all to get 5dn, beginning as it did I.T, with INTER-something seeming likely, and the TRAFFIC coming quickly from TARIFF … and I’ve never come across the word before. 21ac looked easy, with .HE.I.T, but since there’s no E in THIN RAY (an obvious anagram), it was likely to be a clash, and RHYTINA was the answer. NORMANS, VIETNAMESE, DISARRAY and AKEDAH were next, and then ERIDANUS which is a constellation I’d not heard of, and wasn’t in Chambers (that I could see). That was pretty much the northwest corner of the grid completed, but I wasn’t expecting too quick a finish because sometimes Listeners just don’t work like that! Still, I had six clashes identified, five of which spelt out TIMES in a V shape … and still I didn’t tumble the theme. Having said that, when I’m solving clues I tend to concentrate on just that, and don’t give much thought to other requirements of the preamble unless I really get stuck. Of course, I do read the preamble fairly often, especially if it’s long and tortuous, which this one isn’t. 17ac was TAMALE and 15ac LIES, a bit tricky being rugby team LIONS – O (the ball) and changing direction (N to E); this gave a misleading pack, ie of LIES. A little trio of clashes near the NE corner gave LIS, and finally the penny dropped … LISTENER and TIMES are connected by 23 March 1991 being the date that the Times took over publication of the Listener crossword. So there are likely to be two sets of TIMES crossing each other near the southwest corner, and could LISTENER be in the shape of a cubed sign to reveal X(=10)3 = 1000, the number of puzzles published by the Times. Finally the ‘as calculated from a slightly earlier departure’ became clear, meaning that puzzle 3089 (the last Listener published on 3 January 1991) + 1000 gives the number of this puzzle. The rest of the puzzle slotted into place fairly quickly. I’m a bit annoyed that I didn’t get SUPERSCRIPT earlier on (I concentrated too much on the NW corner), but JAYWALKER was a clue to enjoy. And so on through BELATEDNESS, CAGLIARI (for which Bradford’s came to the rescue, although not for the first time in this puzzle), and THUMBSTALL at last (for which Chambers came to the rescue). A couple of clues needed special attention: 35ac, KREESE could have been CREESE, so needed careful analysis (SEEK returned holding last of heR plus E for energy), and 32dn, GREW, which careless completion could have resulted in GREY (GREY + With – Year). A tip to novices is to ensure that you fully analyse, and are happy with, every clue using both definition and wordplay. 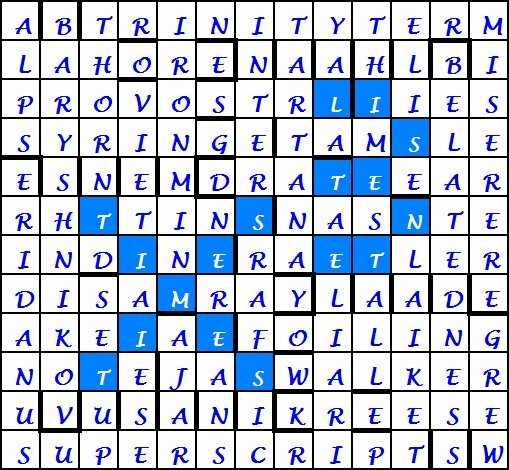 I think this was a fairly easy puzzle, ideally suited to Listener novices, with more than the normal number of anagrams, and a relatively straightforward final step. I write that from someone who knows the history of the Listener crossword fairly well; perhaps the novices among you did in fact find the final step a bit tricky. A really enjoyable puzzle from Kevin, and a celebration which could easily have gone unnoticed. Here’s hoping that I see the next thousand puzzles through (by which time I’ll probably be a dribbling wreck). 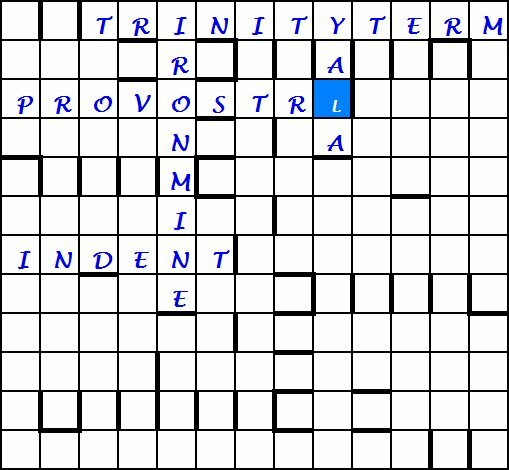 The numpty team does like it when the clues to words that go right down the middle and the lengthy ones along the top and bottom of a crossword are easy to solve, as was the case with Kevin’s easy anagram for INTERTRAFFIC (Reciprocal dealings are cancelled when certain tariff changes), his TRINITY TERM (Trustee adjusted short trying time for court session period) and SUPERSCRIPT (Waving stirrup cup’s less socially acceptable, masking Earl’s elevated character). Clearly we were in for a relatively easy ride after last week’s numerical slog. 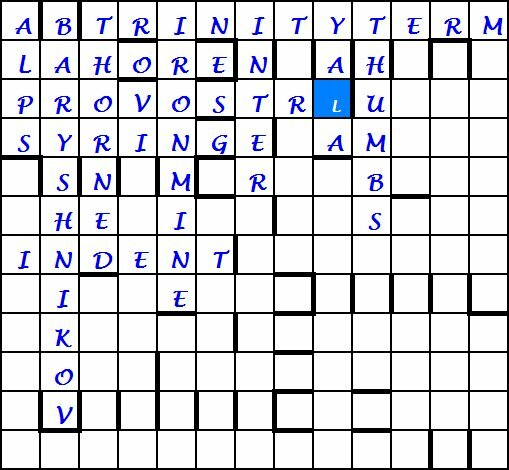 I can’t say often enough what a pleasure it is for newer solvers to occasionally have a Listener crossword that boosts our confidence – and this one did. Words simply slotted into place, one by one, with not a single one that would really stop conversation dead. Even GLAIKIT, a lovely expressive northern word (except that we had to spell it GLAIKET) and RHYTINA – we gossip about those all day long. We were left with one or two gaps. I believe GREW at 32 dn (Became dull with passing year) caused friends a lot of head-scratching, but, as usual, being poor at wordplay played into our hands. It seemed perfectly obvious to me that we had ‘grey’ for dull, losing its Y which passed away or perhaps was surpassed by the W of ‘with’ to give us GREW. KREESE (Endeavour returned conserving last of her energy for a cutter) gave me more trouble, as CREESE, FRAISE and a few other words seemed possible but I finally sorted out the wordplay – ‘seek’ returned, conserving, or holding E (energy) and the last letter of ‘her’. That ‘cutter’ was the sneaky trick, especially as we had been playing with the idea of MAYFLOWER, for the ‘vessel’ in the clue before – sneaky again! Of course it was JAYWALKER (I make reckless crossings, bobbing weakly in vessel). One more little hitch; 30 dn. AJAR had to be the solution to ‘Just about to advance conflict’ but why? What a clever clue! A door that is ajar is ‘just about to’! And we were there! There was the answer. It seems the Times has been hosting the Listener crossword since number 3089. Thank you Kevin – You gave us a Friday finish that we appreciated enormously. (Especially as we were not yet aware of it but AZED’s 1984 was to be a tough challenge). Who could resist colouring in the X and the 3, even if we were not instructed to do that? I tend to set puzzles of the same type in batches using what I call the Jethro Tull method which involves making a small change to get a different puzzle although it is effectively the same. This puzzle was no exception and was set alongside a couple of puzzles for The Magpie ( Pandigital Products and Mind Your Ps and Qs ) and one for the Scottish Maths Council’s Journal and one which appears on the earlier incarnation of this site. The puzzle had an old fashioned feel as I was in a Rhombus clone phase at the time and it wouldn’t have looked out of place 30 or 40 years ago so a denouement would not be required. The satisfaction for the solver is in finding the solutions used, using just the clues given, to an interesting digital relationship. I found the solutions to the problem on the internet at The World of Numbers website and knew full well that solvers could do likewise. However, if I could give solvers enough feedback in the grid and they applied some basic mathematical facts that would all be unnecessary. In fact it is worth remembering that in these types of puzzle if the only way of solving it is to have the solutions in front of you then it won’t be published as it would be unfair! I checked the 78 solutions by writing a bog standard BASIC program and was delighted to find that it agreed with those on the site. •	A pf or multiple thereof repeated in the X, Y or Z. •	The reverse of a pf as puzzles of this type tend to make use of this. •	The same P or Q. ( 2436, 18975 ) and ( 6471, 23589 ) P, Q pairs as the start point and these would provide the way in for solvers. Then came the grid. I toyed, but only briefly, with the idea of a 9×9 Latin square grid. The reason for rejecting that was based on my experiences setting the Quadratum puzzles ( Sudoku based ) for The Magpie as the Latin criterion very quickly takes over. 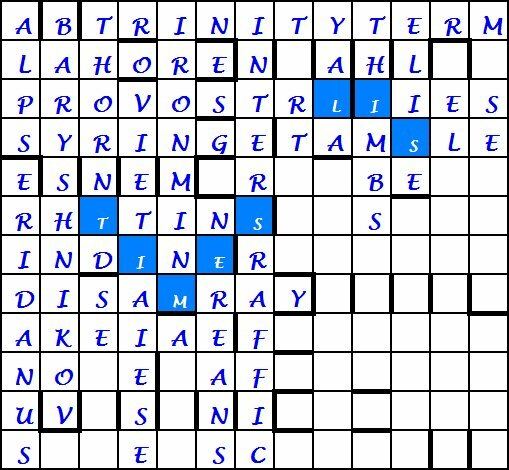 In fact I recall solving Arden’s Domino Squared puzzle in The Magpie which was a 7×7 Latin square with extra bits sticking out using only a fraction of the clues! So I decided on a rectangular one as Rhombus used them and wanted to have no more than 23 across or down clues as using I, L and O causes confusion in this sort of puzzle and Greek letters are a pain. Also I wanted to have some unches but not many, as I wanted to give solvers as much feedback from the grid as possible as this is a CROSS number puzzle after all and so, in a way, circumvent the need for some solvers to calculate the solutions or surf the net looking for them. It only took a matter of minutes by hand to come up with a suitable grid. Having the grid already barred and lettered makes setting this type of puzzle much easier. In the past when I started setting I would have started with a blank grid and barred off as I put in entries but not any more. Further study of the list of prime factors was called for and the neural pathways needed to be cleared so a good dose of keyboard driven 70s prog rock was called for to aid the setting process. As I listened to Emerson, Lindh, Fritz, van der Linden, van Leer, Premoli and Lord batter hell out of their Hammonds I decided that I would leave out parts of some clues if I couldn’t fit them into the grid and get solvers to add them up as a sort of denouement which was something I wouldn’t have dreamed about or dared to do when I started setting in 1993! In those days I would have doggedly obtained clues for all the parts regardless of how clumsy they were. I noticed that 8796 for P appeared twice and 8976 once and decided to use the latter and one of the others for Qs that would be unclued just to make things a bit more awkward especially for those who would be sitting with all 78 solutions in front of them. Those who were solving the puzzle without the 78 solutions in front of them and just using the clues ( solving it properly and in the spirit that the puzzle was set!!! ) would be blissfully unaware of any such problems and so in a sense rewarded for this. 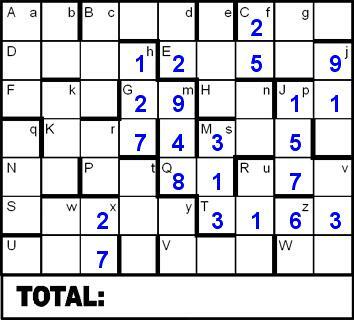 The puzzle was completed in a couple of days and all that was left was the logical pathway through it which made use of the h, 5h and 6h start point along with basic number facts learned at school especially the terminal digits of square numbers. For example if the last digits of P and Q are known then so too is the last digit of Z of course. But if the last digits of P and Z or Q and Z are known then you can limit the possibilities for the last digit of Q and P respectively down to at most 2 digits. For example if P ends in 4 and Z ends in 7 then Q2 ends in 1 so Q ends in 1 or 9. 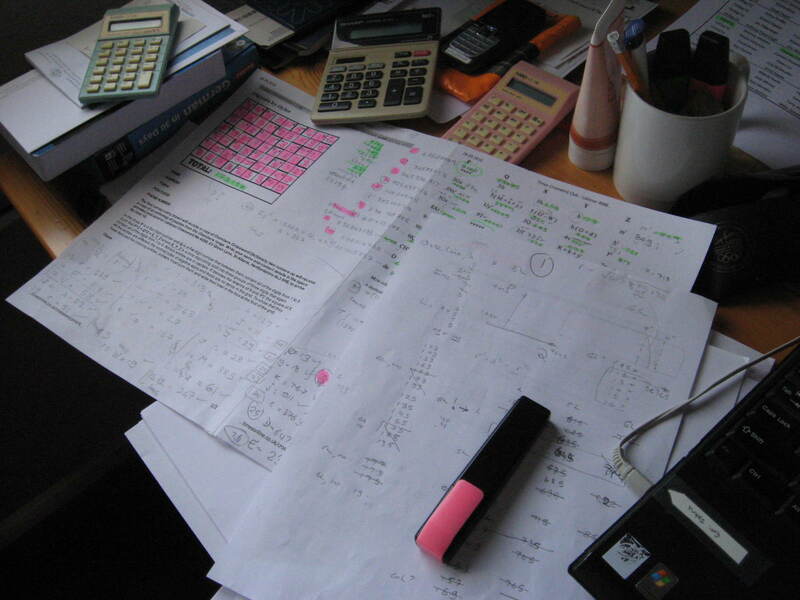 The fact that each digit appears only once in a P, Q pair and X, Y, Z triple as well as almost 90% of the cells being checked cuts down a lot of trial and error and aids the solving process enormously as does the realisation that Q must start with a 1 or a 2. As for 73194 it is a number of no real significance which would probably get some solvers wasting their time trying to find some. But why? To expect PDMs and denouements in all puzzles is unrealistic and not having one would be a nice change. Simples as a meerkat would say! PS It appears that 73194 does have some relevance to the puzzle after all and thanks go to Mr Magoo who spotted that 731942 + 58622 = 5391724680 and I thought that I was a saddo when it came to numbers!!! It was not, as some on the ‘ answer bank ‘ surmised my date of birth in an American calendar – I’m not 16 or 116!! The 31st of July 1894 though is memorable as it was the day of the first powered flight by Sir Hiram Stevens Maxim!! PPS I leave it as a pleasant exercise for readers to discover which groups the keyboard wizards played for. PPPS As a thank you for all the comments about the puzzle I give you a true pandigital experience that The Magpie rejected as far too simples!! Oh no, it’s the dreaded numerical again! I can hear whoops of joy but not so here. The slough of despond is even deeper when I hunt for the clues. Call those clues Rover? Bad dog! There are just rows of hieroglyphics. Perhaps I forgot to print the clues. But no; what you see is what you get. I hand over to the mathematical part of the numpty team. The scope of the problem seems large at first: 5 digits and 6 digits for P and Q alone, 10^11 pairs! There is a drastic restriction to be applied, however, that 1-9 appear exactly once on both sides, in P_Q and X_Y_Z. This would seem to make a solution computable in a finite time. How to use this, and where to begin, though? Line 1 of the clues is a good guess at where to start, and there we see h, 5h and if we are gazing hopefully, 6h again in Line 10 of the clues. The 5h immediately limits h to the form 1ab, to keep 5h as a 3-digit number as defined within the preamble. Indeed, a can only be 2,3,4,5 or 6 for the same reason (1 is used, 6 x 17b too big,..) and b only 3,5,7 or 9 (no 0 allowed in 5h). The 17 possible h combinations (h=123, .., 167) viewed with 5h and 6h reduces the choice of h to 127. One done (but I admit a false start after failing to multiply by 6 in my head correctly)! Trying to avoid really starting work , we note in Line 5 of the clues 5G appears, being of form 2a, and in Line 9 of the clues 7J^2 appears. These give G=25, 27 or 29 and J=11 (both 2 digits). But what now? Time to buckle down to it. The ‘1-9 once only’ rule now has to be applied to the clues. Looking at clue 1, this is trying to find a solution for P and Q as integers where P^2 + Q^2 = X_Y_Z, ie from (using h) 635127489 to 635127984. I imported a free web version of BASIC (see http://www.thinbasic.com for thinBasic) which offers ‘long integers’, in order to do this by programmatic means. It is not too slow to do, as P can only be 1234-9865 in value and we have a smallish range too for X_Y_Z. So I just checked P^2 and Q^2 where for each P in the range 1234-9865, Q had to lie between INT(SQR(635127489-P^2)) and INT(SQR(635127984-P^2))+1 for appearance of 1-9 once and once only in STR$(P^2)+STR$(Q^2) and STR$(P^2+Q^2). This is a loop over about 20000 P-Q pairs, reasonable to try, and quickly yielded P=9168, Q=23475 with X_Y_Z=635127849 so m=948 and G=29. Much the same program can then be modified and applied to Line 4 (a good candidate, where P=145x and Q=9T, reducing the checks to be made a good deal). This yields x=27, T=3163, f=25 and thus s=313 in Line 1) and so on …. The longest computation was for Line 8, 294 seconds and 3 M loops. Others were typically 1-10 seconds. About 5 hours of work, including much fumbling with a slightly different BASIC version which had a tendency to go silent if I missed out important syntax elements! I am pretty sure that the real mathematicians know some drastic shortcuts, but it was an enjoyable and approachable puzzle. Oyler’s first Listener since, for me, the unforgettable Pentomino Factory last February. However, Digimix looked conventional and in appearance perhaps reminiscent of a Rhombus puzzle. I only had time for a brief blog on this since I was shortly off on holiday walking in the Mountains of Mourne, which I can highly recommend. In fact there were only 32 eligible values to check, 16 in each group, and only one fit was found: Q = 23475, P = 9168. Factorising Q (3fs): 23475 = 3 × 5 × 5 × 313 so f = 25, s = 313 and m’ = 849. I did then use BBC Basic to check that this was indeed a unique solution to clue 1. And so it went, an absorbing meander through the clues until just clue 11 with its three unclued parts remained. Since P = 8796 and Z = 297, Q = 2?? ?1 with the unknown parts = 345 in some order. 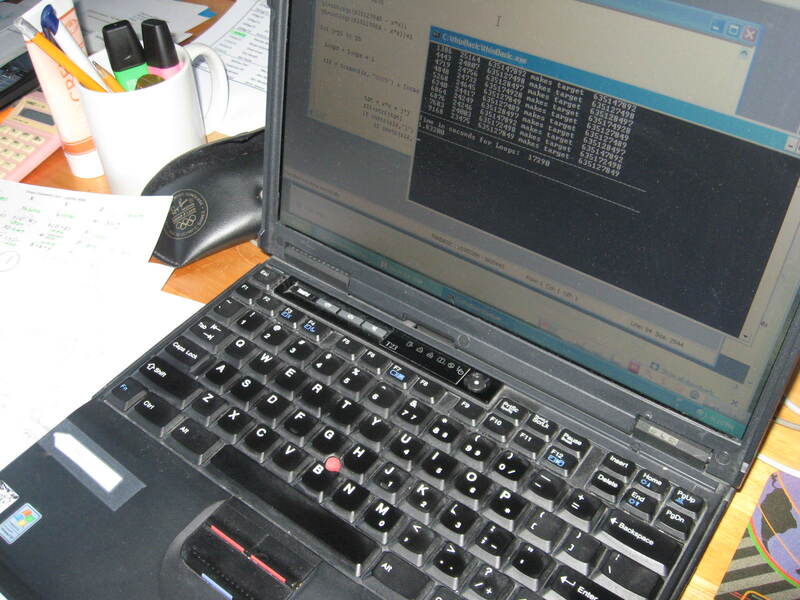 This left six values for Q to check and Q = 23541 and X_Y_Z = 631548297 were soon found. 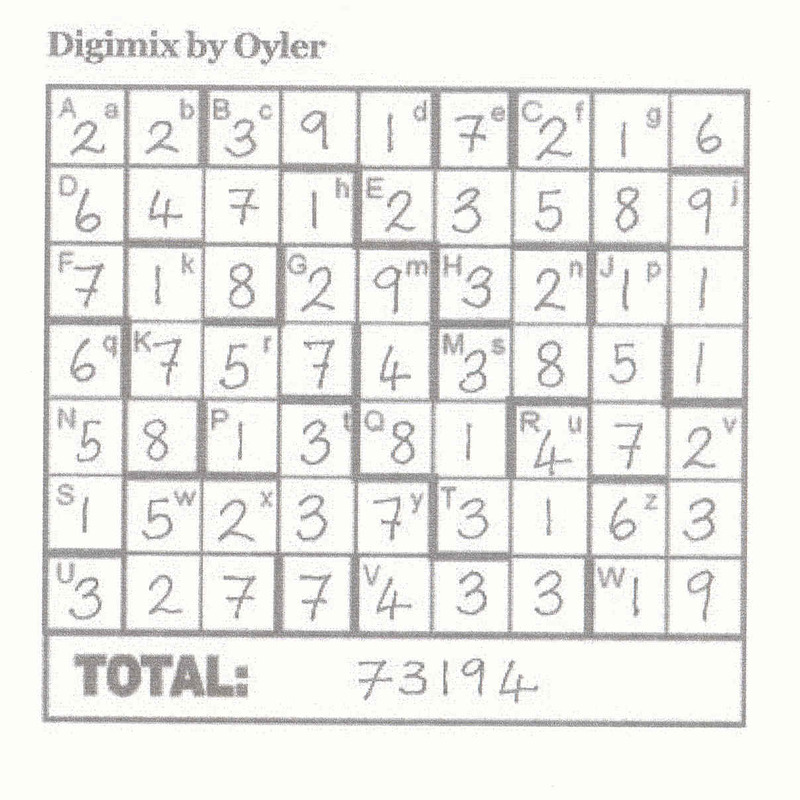 5862 squared plus 73194 squared equals 5391724680, a truly pan-digimix dénouement! To show that they have correctly deduced the asterisked parts, solvers must sum them and then derive a more fully thematic total to be entered in the box beneath the grid. The inference is that the test solvers were indeed confused here. However, I must not dwell on the ending, which did not really spoil a puzzle that I found hugely entertaining and masterfully constructed – thank you Oyler. 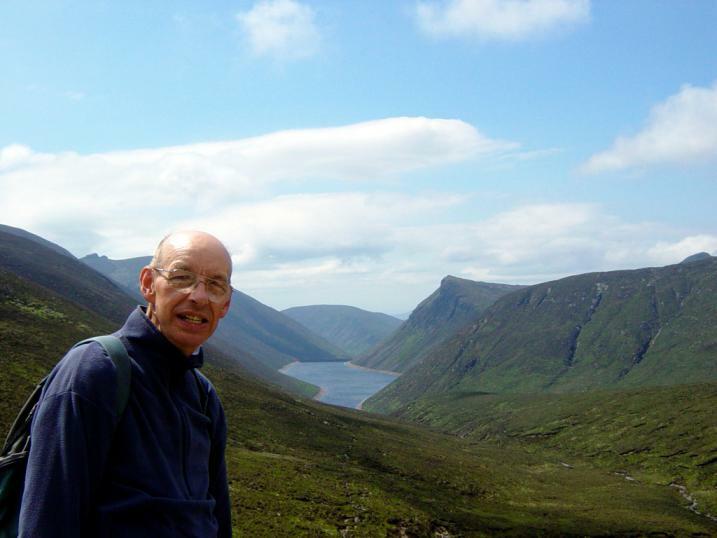 As a postscript, here is a picture of me in The Mournes last Thursday with the Ben Crom Reservoir in the background – I wish I was still there.